We can forgive Ariana Grande for being slightly lethargic during her showing of Into You and Dangerous Woman at The Voice. Coming off of the back of her brilliant set at the Billboard Music Awards, it wasn't entirely unexpected that she had a little less bounce in her step. Perhaps that's why Christina Aguilera was added to the musical soup - to spice it up. Yep, the Voice of one generation met another during The Voice finale! The result? A mess. 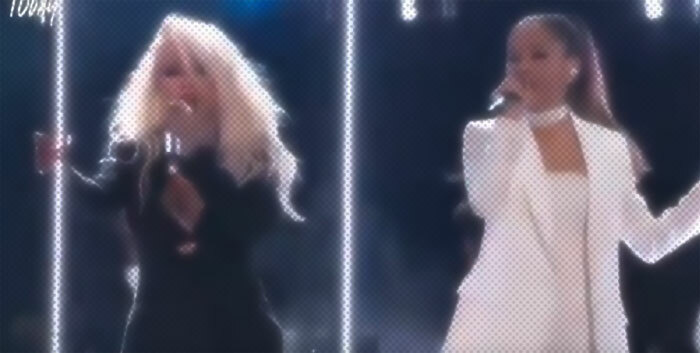 Without Christina on stage, Ariana was at least still slaying the vocals. But somehow adding Christina into the mix deflated the whole production. Thus, what should have been an Earth-shattering duet actually turned out a limp and floppy affair. It might not have been your song Christina, but did you even want to be there? Your half-hearted attempt, ugly tone and confused lyrics were telling me no. And I don't wanna hear anyone say Christina was being respectful to Ariana. That isn't how Christina operates. Seriously, though, is Christina's tone getting worse or was it just more noticeably unattractive when placed next to Ariana's? It looks like singing is utterly exhausting for her.